The director says he wants to make the best movie that he can. Uncharted fans have cause to be happy, or at least cautiously optimistic: Neil Burger, the new director behind the Uncharted movie, seems to be something of a fan of the game, and says that he wants to get as many of its "very cool and very intense" moments into the movie as he can. 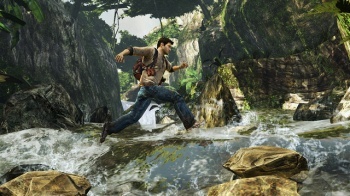 Burger said that what appealed to him about Uncharted was that it was a "classic, great adventure." He said that he really like the character of Nathan Drake, comparing him to someone like a war correspondent or an extreme adventurer. "I know guys like him ... these guys that are living in a very different way and who are slightly hustlers or con men. I think it's a great character." He was aware that previous videogame adaptations hadn't lived up to their potential, but said that the way to break that streak was just to make the best movie you could out of the material. "We need to make it exhilarating and wild," he said. "Make you completely identify with this character and take you along on this ride." As exciting as this all sounds, it's probably going to be quite a while before we actually get to see the movie. Burger has confirmed that he is essentially starting from scratch on the project. Burger is also writing the script for the movie, which is a pretty handy for getting exactly the movie exactly the way he wants it.